Our offices are located in the Department of Electronics and Telecommunication (DET), at the first floor above classroom 12 (“sede storica DET”). The closest Politecnico entrance is located in C.so Montevecchio 71, Torino (map). The entrance is on the first floor close to the elevator, where you find the phone from which you can call us. Note that most of the offices of the DET department are instead located in another side of Politecnico (“scavalco”) which is far from our offices. Beware of this when walking to our offices. Then follow the big corridor on your left, passing classroom 2,4 and 6. At the end of the corridor, make a right and go straight up to the end of the main corridor, passing classroom 8, 10. Continue by a smaller corridor until you get in front of a wall. Follow the corridor passing close to classroom 12. After a green door, there are two elevators and a stair. Go up to the first floor, where you can find the main entrance of the Electronic Department. Use the phone to dial the number of the person you wish to contact. Below is a map. 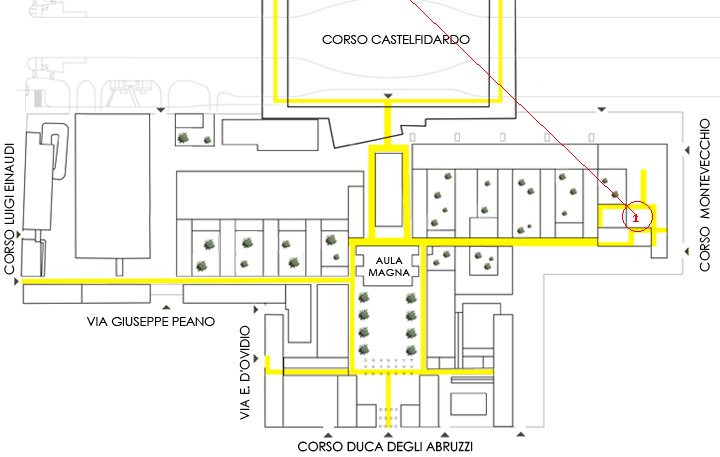 Large corridors are highlighted in yellow, and the red circle shows you the stair to the main entrance. Trains arrive at the stations of Torino Porta Nuova and Torino Porta Susa. The best choice to reach our offices is Porta Susa. On foot: exit the station on the left side and cross the street (via Sacchi) to its right side, under the arcade. Go straight on till you reach the C.so Montevecchio 71, Torino (map). T junction with corso Stati Uniti and turn right into this street. The third major crossroad is corso Duca degli Abruzzi, where you turn left. Approximately 100 meters into this street, you will find the main entrance to the Politecnico on the right. About 15 mins of walking distance. By taxi: exiting the station on the left side, you will find the taxi ranks. About 5 mins of driving. By bus: proceeding as for “on foot”, you will find the bus stop of No. 58 or 58/ in C.so Stati Uniti, just after via San Secondo. The fourth stop of this bus lines leaves you at the main entrance to the Politecnico in corso Duca degli Abruzzi. About 5 min of raiding. On foot: exiting the station from the south entrance, you will find yourself in Corso Bolzano. Turn right and keep walking 800m in south direction until you reach the entrance in C.so Montevecchio 71, Torino (map). About 10 min of walking distance. By taxi: exiting Porta Susa Station, you will see the taxi ranks. About 5 minor driving. By bus: exiting the station, you will find a city bus stop at your left. Take the No. 10 line that goes towards via Cernaia (or alternatively the tram No. 10 that runs to the right). Getting off at the third stop leaves you at the main entrance to the Politecnico. About 5 min of raiding. “Sandro Pertini” Airport (Caselle) has links with the city center via an Airport Shuttle whose terminal is next to the principal railway station of Porta Nuova (corner of via Sacchi and corso Vittorio Emanuele). Please, have a look at airport web page and on information about bus transportation. You can refer to the suggestions available here.